Data acquisition in cardiac imaging has to be synchronized with heart and respiratory motion. For this purpose an electrocardiogram (ECG) in combination with a breath-hold or a respiratory navigator is usually applied. However, these motion monitoring techniques, necessitate patient cooperation and increase the complexity of the examination. Furthermore, the ECG signal may be distorted by radio-frequency and gradient action and the navigator signal might not precisely represent the respiratory motion of the heart. In this work a prospective, self-gated approach for free breathing cardiac imaging is presented requiring neither of the monitoring techniques described above. The motion data used for cardiac triggering and respiratory gating are extracted and processed in real-time from repeatedly acquired data at the k-space center. Image quality with the proposed method was found to be comparable to ECG triggered breathheld acquisitions while the scan efficiency was significantly increased. 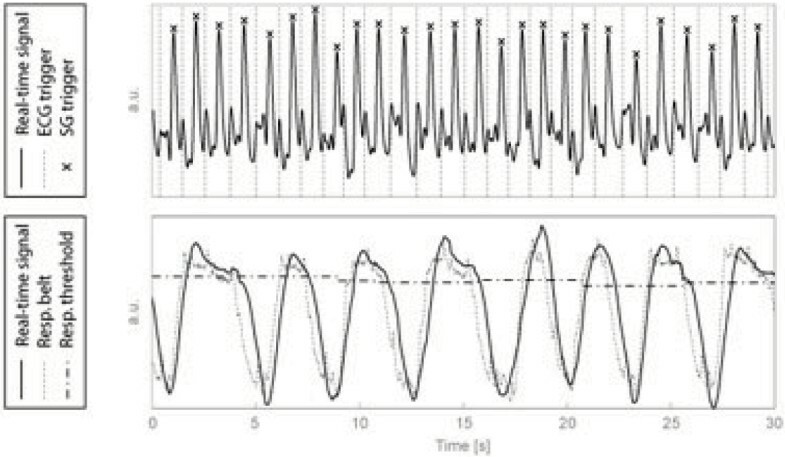 To repeatedly measure the k-space center a modified SSFP sequence  was implemented, providing a signal which contains both cardiac and respiratory synchronous variations (Figure 1). Cardiac variations arise from changes of the blood volume in the heart during the cardiac cycle. Respiratory-related variations stem from moving structures such as the liver or abdomen which shift in and out of the sensitive imaging volume during the respiratory cycle. Since cardiac and respiratory signals are superimposed, real-time separation is necessary in order to use the motion information for prospective cardiac triggering and respiratory gating. To this end, two efficient filters were designed complying with real-time requirements. A Butterworth band-pass filter extracts the cardiac related signal component followed by a peak-finding algorithm providing the cardiac trigger. For extracting the respiratory motion variation an adaptive averaging filter was implemented which uses the detected trigger-points to average over one cardiac cycle. Also an adaptive threshold was implemented for definition of the respiratory gating window. In image reconstruction data were re-filtered based on the stored motion signal in order to correct for the latency of real-time filtering. Modified SSFP sequence for self-gating. For motion data acquisition all gradients after the rephasing slice encoding gradient are shifted to record an FID at the k-space center. A prospective self-gated approach for cardiac imaging was successfully implemented and evaluated. Cardiac and respiratory related signal variations were accurately detected in real-time from the repeatedly acquired k-space center. The image quality obtained is comparable to retrospective and ECG-triggered approaches. To test the feasibility of the approach a cardiac four-chamber view of a healthy volunteer was acquired (TR = 4.5 ms, TE = 2.6 ms, flip angle = 60°, scan matrix = 192 × 186, FOV = 320 × 320 mm2, slice thickness = 8 mm, 11 lines/segment, 30 cardiac phases) using a five channel cardiac coil array. To asses the quality of the extracted self-gating motion curves, signals from an ECG and a respiratory belt were simultaneously acquired and stored. As reference a retrospective self-gating acquisition described in  was performed. In the retrospective approach the data are evaluated after the acquisition, therefore requiring temporal oversampling of the data to ensure that every profile is acquired at least once in an acceptable motion state. Additionally, a standard ECG triggered breathheld acquisition was acquired as second reference. 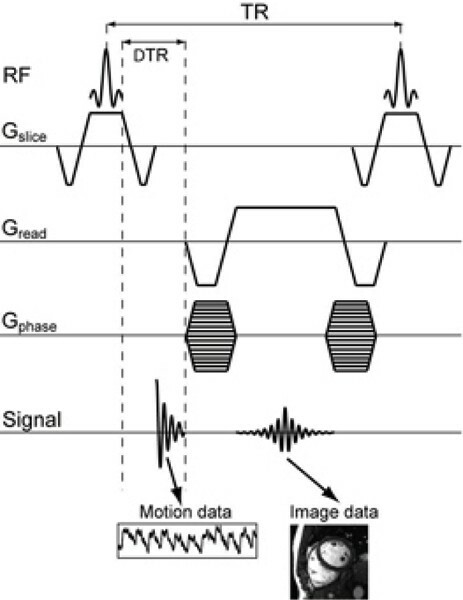 Cardiac and respiratory signals could be extracted in real-time and were comparable to the wired ECG and respiratory belt signals (Figure 2). The standard deviation of differences between the wired ECG signal and the self-gating trigger was less than 11 msec. Reconstructed images were of comparable quality relative to the retrospective self-gated approach. At the same time, scan efficiency of the prospective method was significantly increased relative to the retrospective approach (prospective: 64 sec + 10 sec preparation period, retrospective:160 sec). Both, the prospective and the retrospective methods compared well with the standard ECG, breathheld acquisition (Figure 3). Filtered cardiac and respiratory motion signals from the raw motion signal from k-space center. Trigger points calculated from self-gating signals are marked with x. Dotted vertical lines represent the wired ECG trigger points acquired for reference (upper panel). The respiratory trace obtained in real-time is compared with respiratory belt signal (lower panel). Note that the respiratory signal exhibits a shift due to the averaging filter. Additionally the adaptive threshold used for gating is shown as slash dotted line. Images from a cardiac four chamber view. Standard ECG triggered breath-hold acquisition, retrospective self-gating acquisition and prospective real-time self-gating method. The overall image quality of the prospective method is comparable to both ECG triggered with breath-hold and retrospective acquisitions. It has been shown that cardiac and respiratory variations can be accurately detected prospectively using signals originating from the k-space center and thereby eliminating the need for external cardiac and respiratory signal detection. Compared to the retrospective self-gating approach total scan time could be reduced while image quality was well maintained.